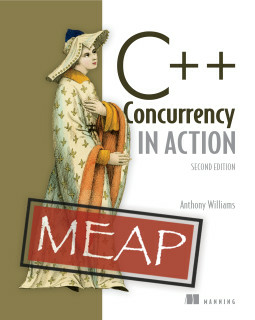 I am happy to announce that the second edition of my book, C++ Concurrency in Action, is now available under the Manning Early Access Program. The second edition is being updated to cover C++14, C++17 and the Concurrency TS, along with general improvements throughout the book. std::shared_mutex and std::shared_timed_mutex. These provide for multiple-reader/single-writer mutex locks. std::scoped_lock from C++17 for locking multiple mutexes together. Parallel overloads of many standard library algorithms include std::sort, std::for_each and std::transform_reduce. std::experimental::atomic_shared_ptr to allow atomic accesses to a single shared_ptr instance from multiple threads, as a better alternative that the std::atomic_load and std::atomic_store free functions. Extended futures that allow continuations, so additional functions can be scheduled for when a future is ready. std::experimental::when_all and std::experimental::when_any to allow waiting for either all of a set of futures to be ready, or the first of a set of futures to be ready. Only the first few chapters are available at the moment, but if you sign up now, then you will get those chapters in PDF form now, as well as updated PDFs including the later chapters as they become ready, along with updates for the earlier ones, and a final print copy of the book when it's done. If you use the code mlwilliams4 at the checkout when you sign up for the MEAP before 27th March 2017 then you'll get a 50% discount. If you liked this post, why not subscribe to the RSS feed or Follow me on Twitter? You can also subscribe to this blog by email using the form on the left.